I wrote “Inochi“. It means “Life” in English. “Inochi” has meaning that fundamental forces that keep a living thing alive. 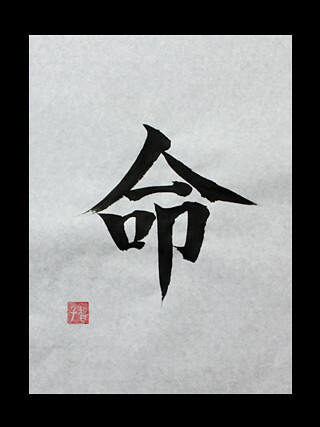 If this kanji symbols is read “Mei”, It has more meanings – Order, Instruction and Destiny. Hi, Chris. Thanks for comment. ‘Farmer’ has many Japanese kanji symbols. I am unable to make a decision. You mean the person who cultivates the fields and live by one’s farm produce, don’t you? Or, do you mean the person who manage plantation? Please give me advice. Thank you.